Abstract. In the Mediterranean region, climate and land use change are expected to impact on natural and agricultural ecosystems by warming, reduced rainfall, direct degradation of ecosystems and biodiversity loss. Human population growth and socioeconomic changes, notably on the eastern and southern shores, will require increases in food production and put additional pressure on agro-ecosystems and water resources. Coping with these challenges requires informed decisions that, in turn, require assessments by means of a comprehensive agro-ecosystem and hydrological model. This study presents the inclusion of 10 Mediterranean agricultural plants, mainly perennial crops, in an agro-ecosystem model (Lund-Potsdam-Jena managed Land – LPJmL): nut trees, date palms, citrus trees, orchards, olive trees, grapes, cotton, potatoes, vegetables and fodder grasses. The model was successfully tested in three model outputs: agricultural yields, irrigation requirements and soil carbon density. With the development presented in this study, LPJmL is now able to simulate in good detail and mechanistically the functioning of Mediterranean agriculture with a comprehensive representation of ecophysiological processes for all vegetation types (natural and agricultural) and in a consistent framework that produces estimates of carbon, agricultural and hydrological variables for the entire Mediterranean basin. This development paves the way for further model extensions aiming at the representation of alternative agro-ecosystems (e.g. agroforestry), and opens the door for a large number of applications in the Mediterranean region, for example assessments of the consequences of land use transitions, the influence of management practices and climate change impacts. 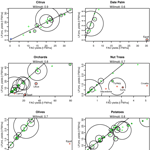 How to cite: Fader, M., von Bloh, W., Shi, S., Bondeau, A., and Cramer, W.: Modelling Mediterranean agro-ecosystems by including agricultural trees in the LPJmL model, Geosci. Model Dev., 8, 3545-3561, https://doi.org/10.5194/gmd-8-3545-2015, 2015. 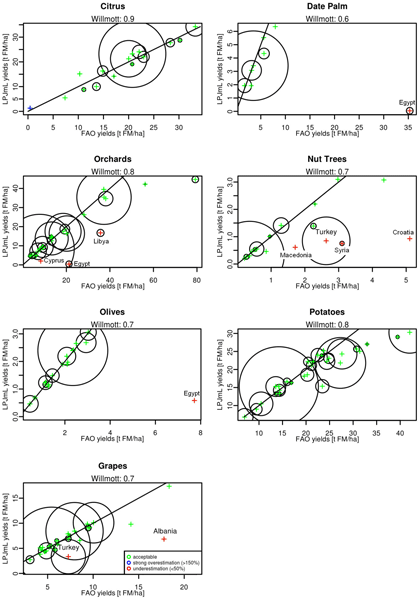 This study presents the inclusion of 10 Mediterranean agricultural plants in an agro-ecosystem model (LPJmL): nut trees, date palms, citrus trees, orchards, olive trees, grapes, cotton, potatoes, vegetables and fodder grasses. The model was successfully tested in three model outputs: agricultural yields, irrigation requirements and soil carbon density. With this development presented, LPJmL is now able to simulate in good detail and mechanistically the functioning of Mediterranean agriculture.